K-punk asks FACT magazine – Is Music Writing Obsolete? I recently had a conversation with someone who argued that writing about music was obsolete. Now that is so easy to access practically any music online, he claimed, there is no real role for reviewing. Electroclash music: FACT magazine – 20 best: Electroclash. Electroclash was one of the first truly retro-futurist sub-cultures – it looked to the past for the ideas and impetus to move forward. compilation: RA: ZE celebrates 30 years. Music News Strut Records will release Ze 30: Ze Records 1979-2009 Summer 2009.
mix album; RA: LTJ Bukem mixes up Fabriclive.46. Music News - Fabric will release Fabriclive.46: LTJ Bukem on June 15th, 2009.
new Burial track: gorillavsbear.net: new burial: "moth"
Relapse Records has announce the signing of CULTED. The band (Michael Klassen, Matthew Friesen, Kevin Stevenson and Daniel Jansson (KEPLERS ODD, DEADWOOD)) have recently completed work their debut album, Below The Thunders Of The Upper Deep, which will see its international release this July. new label deal: Leaf Label signs Vladislav Delay | NEWS | ITSATRAP2009 - expect a ne album later this year. The Perfect Depth Of The Mermaids, the new video from Spanish prog-rock/art-metal band NAHEMAH, can be viewed below. Irish guitarist Mark O'Leary emerged on the global improvised music scene in the last few years, pushing his bold vision and broad scope of musicality through constantly-changing collaborations. O'Leary can cross easily between genres, from progressive, synth-laden rock and seventies fusion to free jazz and abstract soundscapes. Soma will release Silicone Soul on June 22nd, 2009. Indie Recordings has announced the signing of SOLEFALD. The group's seventh album will be released later in the year. New issue of textura now online. The artists confirmed so far are: Yoko Ono Plastic Ono Band, Sean Lennon, Cornelius, The Master Musicians of Joujouka and Bachir Attar, Patti Smith, The Silver Mount Zion Memorial Orchestra, David Murray, Gwo-Ka Masters, Jamaaladeen Tacuma, Baaba Maal, Yo La Tengo, Moby, Bobby McFerrin, Charlie Haden's Liberation Music Orchestra, Carla Bley, Robert Wyatt and The Bad Plus. Trevor Horn has produced Kid Harpoon's debut album, the first pop record he has worked on since Pet Shop Boys' Fundamental in 2006.
mix compilation: RA: Anthony Rother lights the Fuse. Music News Music Man will release Fuse presents Anthony Rother on May 26th, 2009. 2009 album: RA: A Mountain Of One prep debut album. Music News A Mountain Of One will release Institute Of Joy in September. ARCTIC PLATEAU - this is the nom de plume of Gianluca Divirgilio, an Italian musician with an incredible sense for epic arrangements and song structures whose first recordings offer timeless music between the poles of Post Rock, Shoegaze, New Wave and Indie. Philpot will release Break SL's City Wasteland on May 18, 2009. 2009 album: RA: Billy Dalessandro preps Polis. Music News: "Soniculture will release Polis on May 4th, 2009." Editors have announced that Flood is to produce their new album. Expected in the autumn. San Francisco’s cult punk outfit Flipper, widely considered to be the progenitors of grunge, are set to release a brand new studio album entitled Love, their first in over 16 years, along with a companion live album, Fight. Swedish art rockers return with a new album: Gösta Berlings Saga II - Archive - Track listing cover art PRE-ORDER! We are glad to finally reveal that the next album, titled Detta Har Hänt, will be released worldwide on Transubstans Records in May/June. The album was recorded during winter 08/09, partly assisted by Mattias Olsson of Änglagård and represents the evolvement the band has taken since the release of the critically acclaimed debut album Tid är Ljud (2006). Whereas the previous album dealt with the interaction between nature and city, Detta Har Hänt focuses entirely on the latter with eight stories of industrialism and love. Editions Mego will release Florian Hecker's Acid In The Style Of David Tudor on May 12th, 2009.
album streaming: The New Thing: Listen to the new Horrors album. - completely changed music direction for the better - the surprise / biggest improvement of 2009? IQ release new album 'Frequency' through Inside Out on June 22.
interview: troubled diva: Interview: Elly Jackson, La Roux. interview: RA: Machine Love: The Juan Maclean - Feature / Interview. RA continues its new feature series, Machine Love, with a look into the working methods of a man devoted to hardware: The Juan Maclean. MONOLITHIC is the two-headed audial monster consisting of Stian Westerhus (Jaga Jazzist, Puma, etc) on baritone guitar and Kenneth Kapstad (Motopsycho and previous member of Dadafon and Animal Alpha) on drums. The Berlin label will release a new album from Slater's Planetary Assault Systems guise later this year. Ostgut Ton will release Temporary Suspension on June 22nd, 2009. Released on Megahype and available May 1st, 2009. Simon Scott - Debut album "Navigare" released in June 2009 on Miasmah Recordings (run by Erik Skodvin from Deaf Center/Svarte Greiner) with special guests Jasper TX and Rafael Anton Irisarri. Simon Scott is the ex slowdive drummer. 2009 album: Gothtronic | News: SE Debuts on TYMPANIK AUDIO: ‘Epiphora‘ will be available on digipak compact disc April 20th, 2009 only from Tympanik Audio." "Stjarna is the new band of John Alexander Ericson. Together with Jamie Kane, he creates an amazing, beautiful, heartfelt and individual music with international quality. Talk Talk’s classic ‘Sprit of Eden’, My Bloody Valentine’s ‘Loveless’ and the more recent Sigur Ros ‘Untitled’ album are all main influences and the beauty of these records are put across in Alex’s voice and the complexity and simplicity of the music that surrounds him makes Stjarna stand out from any music that is around. Stjarna is a brillant, psychedelic trip and Ericson's emotional vocals float above the musical flashing sky as he never sounded before." Annie Clark - aka St Vincent - who releases her second album next week, writes songs with charm and an acerbic wit that delights the critics. So why's her mum so worried? Tympanik Audio is proud to present the new album by Tapage titled ‘Fallen Clouds‘. A destination that never reveals, leaving the listener in a serendipitous dream state while continuously surrounded by sticky beats, addictive rhythms, and trip-tech electronic collages. A master craftsman of progressive Electronica, Tapage combines smart beats, perfect and stirring pattern timing with dense and alluring atmospheres. Musically TF have taken influence from past masters such as Sonic Youth, My Bloody Valentine, Loop etc but their sound encompasses influence from modern experimental noise bands like The Skaters, Double Leopards, Emeralds etc. Tigers That Talked were formed by singer Jamie Williams in 2006 and are based in Leeds. Their music possesses the ramshackle folk rock of The Arcade Fire and is influenced by the filmic elegance of Ennio Morricone, Sigur Ros and The Cure. The band, previously released a number of self-produced DIY EPs and are currently busy recording their debut album for release on Bad Sneakers in September 2009. The new VNV NATION album ''Of Faith, Power and Glory'' will be released on June 19th in Europe and on June 23rd in North America. Have a browse through...2009 Albums [1280 Albums] - 2009 A - Z Albums Tracking List - a starting guide to new & forthcoming album releases. also: 2009 Expected [738 artists] - Artists that are expected to release new albums in 2009 - awaiting announcements of album titles and release dates. New issue of Mojo features Nick Drake on the front cover. Crate diggers extraordinaire Dan Tyler and Conrad McDonnell sit down for a chat with RA's Dave Stenton. Invada Records profiled: Cargo Records Distribution UK: Geoff Barrow's Invada Records features in NME! Note: at the weekend I will focus on catching up with artist news. New issue of Uncut magazine looks thoroughly boring, Bruce Springsteen yet again on the front cover ! just so lazy, complacent and lacking in ideas ! This is music news treated as data since the site uses a mixture of RSS, data mining, crawlers and aggregation. So far it holds half a million articles about 5,000 artists, and hosts 10,000 concert listings from more than 2,000 UK venues. Gigulate claims to have 25,000 users now and to be in talks with a number of online publishing partners. Burning Man sculptures, steam room breaks and a fake hotel: It's all part of what has made Wolf + Lamb one of the most exciting labels of 2009. RA's William Rauscher sweats it out to find out more. In the new NME, on sale across the UK from Wednesday April 22, you'll find your Euro Festival Guide 2009 free inside. RA picks the May festival highlights from across the globe. Detroit, Montreal, castles in Ireland. It must be May, and it must be the real beginning to the festival season. Take a quick jaunt with us across the world to find out our picks for the month. Lollapalooza announced: Lollapalooza 2009 Lineup: Now With 100% More Animal Collective - Stereogum and Faronheit: The 2009 Lollapalooza Lineup! We start our journey at the very beginning with performances by the genres most influential pioneers who started out over 50 years ago. We explore how their influence has had an impact on contemporary new wave electronica and dance music. The Suoni Per Il Popolo Festival (Sounds for the People Festival) is a dynamic, community based leftfield music festival which takes every June in Montréal, Québec. It presents an eclectic collection of musical genres which includes but is not limited to free jazz, noise, electronica, turntable art, pop, soundscapes, experimental rock, twentieth century avant garde, electronica, musique actuelle and spoken word. Check out first list of confirmed artists! This year's festival of avant garde and experimental liberation music will run from June 3 to June 30, 2009 in Montréal, Québec. Artists will include Paul Metzger , Elaine Evans, Electric Kesdjan Ensemble, Pas Chic Chic , Valleys, Dave Burrell Trio with William Parker & Nasheet Waits, Gerard Van Herk & Bloodshot Bill, Skip Jensen, Esmerine, Ignatz, Harris Newman, Fred Lonberg-Holm’s Valentine Trio, Hommage à Alcides Lanza avec Novi Sad, Tim Hecker, Sick Llama, Climax Golden Twins, Tom Carter, Steve Gunn, Shawn Mcmillen, Little Bang Theory. Trio BraamDeJoodeVatcher, Stars Like Fleas, Echoes Still Singing Limbs, Arrington de Dionyso, Quartetski, Flymodus, Mika Miko, Knurl, Corpusse, The Unireverse, Dead Science, Menace Ruine, Hyena Hive, TV on the Radio, John Oswald with Germaine Liu and Scott Thomson, Eric Chenaux, Nicole Mitchell's Truth or Dare with Shirazette Tinnin and Renee Baker, Sir Richard Bishop, Oaxacan, Instant Coffee with Lisle Ellis, Martin Schmidt (Matmos) and Jason Willet , Monk's Casino (Alexander von Schlippenbach, Axel Dörner, Rudi Mahall, Jan Roder, Uli Jennessen), Timeless Pulse (Thomas Buckner, voice; George Marsh, percussion; Pauline Oliveros, accordion; David Wessel, live-electronics; Jennifer Wilsey, percussion), Christof Migone/Alexandre St-Onge/Jonathan Parant, Zoom with Lucas Niggli, Jean Derome/Nicolas Caloia/Isaiah Ceccarelli , Veda Hille and Christof Migone, Nomeansno, Rich Medina, Magik Markers, Six Organs of Admittance and Chris Corsano, and Jay Reatard. Tickets for the UK will go on sale at 9am on Friday April 24th and Graffiti Soul is due out on May 25. Susanna heads out on European tour this week with Bonnie ‘Prince’ Billy. New issue of Dazed & Confused magazine is a mavericks issue: Dazed Digital | Dazed & Confused May Issue - Kiss This! You can now catch Flomotion Radio on Resonance 104.4fm at 10:30 every Friday night. Richie Hawtin is set to headline the third annual Audioriver festival in Poland this August. Spectral Sound will release Immune on June 22nd, 2009. Tempe, Arizona-based "melodic and emotional doom/death metal" band FALL OF EMPYREAN has inked a four-album deal with Germany's Grau Records. The group's first release for Grau will be the band's long-delayed third full-length CD, "A Life Spent Dying", which was completed in 2007 with Ryan Butler of Arcane Digital Recording studios in Chandler, Arizona. album review by John Mulvey: Uncut.co.uk | Wild Mercury Sound - Post details: The Field: "Yesterday And Today"
Brooklyn, New York's death/black/folk/doom metallers GWYNBLEIDD will release their brand-new full-length record, "Nostalgia", on April 23.
International Deejay Gigolos will release House Music on May 25th, 2009. Kikumoto Allstars is set to release House Music, his debut artist album, through DJ Hell's International Deejay Gigolo next month. MADDER MORTEM’s new album, Eight Ways, is set for a June 16th release date in the U.S. It will be their first album for Peaceville Records. The Mars Volta will release their fifth studio album on June 23, via Warner Bros.
KMS Records & Fabric Recordings will release History Elevate on June 9th, 2009. Movement 2009 has revealed its full and likely final lineup for the March 23-25 celebration of Detroit techno and contemporary electronic music culture. Matias Aguayo returned to the scene last year with strong criticism for the genre that made him famous. RA tracked the South American producer down during one of his rare visits to his former German home town Cologne to talk about minimal, his life between two continents and why he's partying on the street these days. 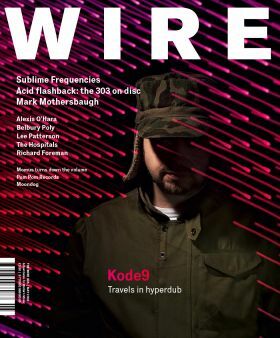 New issue of The Wire features Kode9 on the front cover. Have a browse through...2009 Albums [1160 Albums] - 2009 A - Z Albums Tracking List - a starting guide to new & forthcoming album releases. also: 2009 Expected [741 artists] - Artists that are expected to release new albums in 2009 - awaiting announcements of album titles and release dates. The official Cortney Tidwell video to "17 Horses" taken from the new album "Boys" on City Slang (29.05.2009). I detect PJ Harvey and Sonic Youth influences on this superb track. another UK music festival: Kendal Calling Festival: Kendal Calling Festival Announces LIne-Up | Mixmag - The festival takes place from 31st July - 2nd August 2009, Deer Park, Lowther Estate. Felix Da Housecat is putting the finishing touches on his next album, He Was King, due July 28th. Little Boots reveals debut album artwork | News | NME.COM album: Hands on June 8th. myspace: Nils Petter Molvær unfortunately no new tracks at the mo. 2009 album: The Neon Judgement 'smacks' a new album after 11 years of studio silence - April 28th sees the release of the brand new The Neon Judgement album, Smack. HFN Music will release Trentemøller's Harbour Boat Trips - Copenhagen at the end of June 2009. Geir Jenssen, working under the name Biosphere, is a Norwegian musician known for his ambient electronic music, and will play at The Roundhouse in Camden on 16 May. As recently as the last few weeks, we have been lucky enough to find a way of finishing the end product and we'll be back in the studio in the next couple of weeks to do the mixing and putting the finishing touches to this record. Kansas City, Missouri hadrcore punk/metalcore band COALESCE posted two new tracks — "Wild Ox Moan" and "Questions To Root Out Fools" — on the group's MySpace page. The songs come off COALESCE's first full-length album in 10 years, "Ox", which will be relased on CD and LP on June 9 in North America and June 15 internationally via Relapse Records. Les Discrets have just signed a five-album contract with Prophecy Productions and have thus laid the foundation for a fruitful long-term relationship. The release of the project’s as-yet-untitled debut album is tentatively scheduled for autumn 2009. Les Discrets, the solo project founded by Fursy Teyssier (Alcest, Amesoeurs) in 2003.
another superb album review: Uncut.co.uk | Wild Mercury Sound - Post details: Lindstrøm & Prins Thomas; "II"
Norwegian shoegazers Maribel will release their debut album "Aesthetics" on April 27 via Oslo Grammofon. track: The FADER - Freeload: Meanderthals, "Kunst Or Ars"
Chicago/Peoria, Illinois quartet MINSK has posted a new song, "Three Moons", on the band's MySpace page. The track comes off the group's forthcoming album, "With Echoes In The Movement Of Stone", which is scheduled for release on May 26 in North America and June 1 internationally via Relapse Records. Norway's TRAIL OF TEARS has posted a new song, "The Feverish Alliance", on the band's MySpace page. The track comes off the group's sixth album, "Bloodstained Endurance", which will be released this spring via Napalm Records. Innovative French metallers ERYN NON DAE. have set Hydra Lernaia as the title for their debut album due June out 19/22 in Europe and the 23rd in Europe. Hydra Lernaia was recorded, mixed and mastered by Mobo at ConKrete Studio in Bordeaux, France. new 2009 album: RA: Sinner DC prep Crystallized. Music News - Ai Records will release Crystallized on April 20th, 2009.
new 2009 album: Gothtronic | News: UNTO ASHES Presents New Album The Blood of My lady Released on Projekt and available May 5th, 2009.